"Teller On Demand" is the new Interactive Teller Machine offering you a fast, next level experience for all your banking needs. 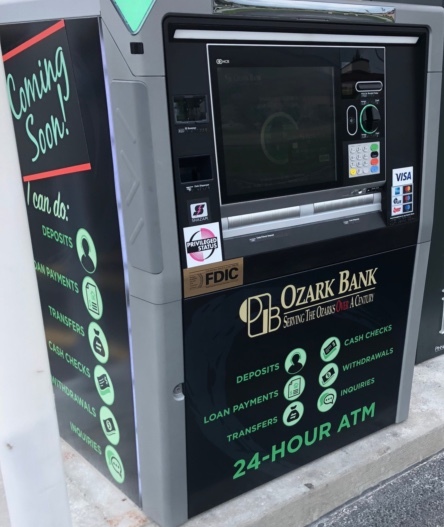 An Ozark Bank hometown teller will work through TOD to: make payments, deposits, withdrawals, transfers, handle inquiries, and cash checks down to the penny. When you come to see TOD, you have the option to begin a "live session" with a teller by touching anywhere on the screen, or simply using the machine as an ATM by inserting your debit card. The live sessions are conducted by someone inside one of our branches- it will just be through glass, much like conducting a transaction through a drive through window. TOD wants to be where you are. The four locations you can find TOD are listed below. TOD wants to simplify banking for you. No deposit slips, no withdrawals slips, no payment slips are needed. Everything is done via touchscreen and you will receive check images on your deposit receipt.